The STAN Children's 'Dig' is designed with fun and learning in mind. Children love dinosaurs, almost as much as they love to dig in the dirt, which is why this dig site will quickly make your establishment a favored destination. The STAN T. rex dig is made in sections. Each section is composed of replica bones set into simulated matrix. 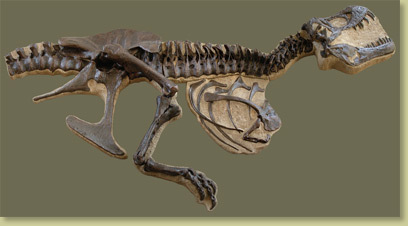 The bones are set in a fixed partially articulated position. The STAN T. rex dig sections are made according to your space and shape requirements. You make the dig pit, install the STAN dig replica and cover it with artificial matrix (ask us for ideas about what to use). 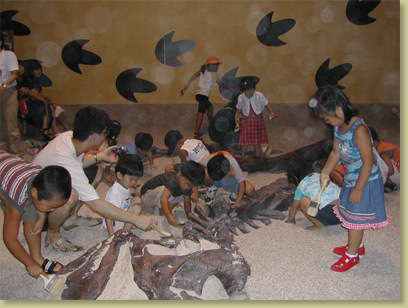 Children will eagerly pursue their new career in Paleontology! Credit The original STAN T. rex skeleton is on exhibit at The Museum at Black Hills Institute, in Hill City, South Dakota. Notes May take approximately five months for delivery. Check with us to see if an earlier delivery is possible. ribs, etc. Ask for a quote. Budding Japanese Paleontologists have fun participating in their first "Dino Dig"!